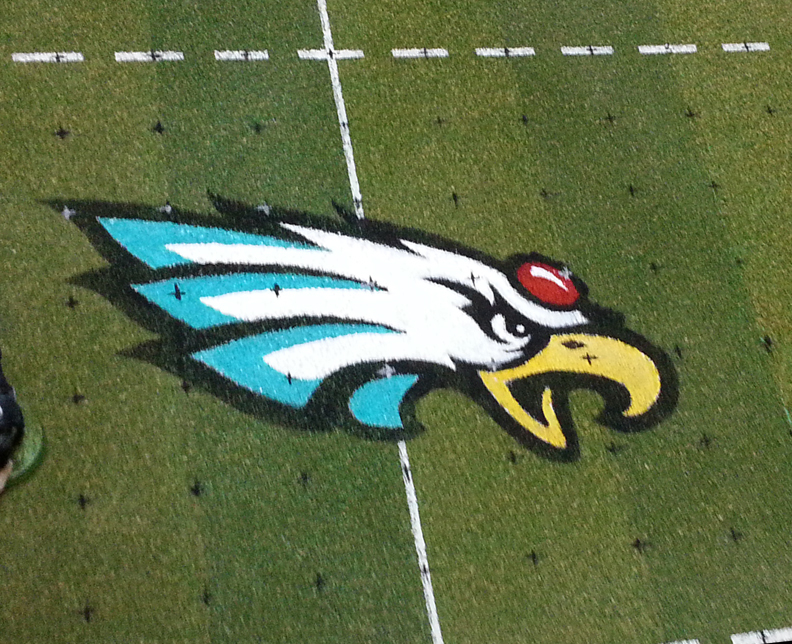 For part 1, please refer to my previous entry, aptly labeled "game 1". 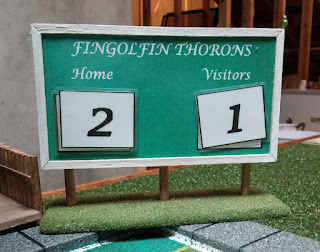 Game 2 pitted Terry's Fingolfin Thorons Wood Elves against the Orcland Raiders. I borrowed the Orcs from Jon Mark, as my humans were being used by Timmy. It was a game of speed vs brute force. How would it turn out? The coin toss saw the Raiders getting the ball first. 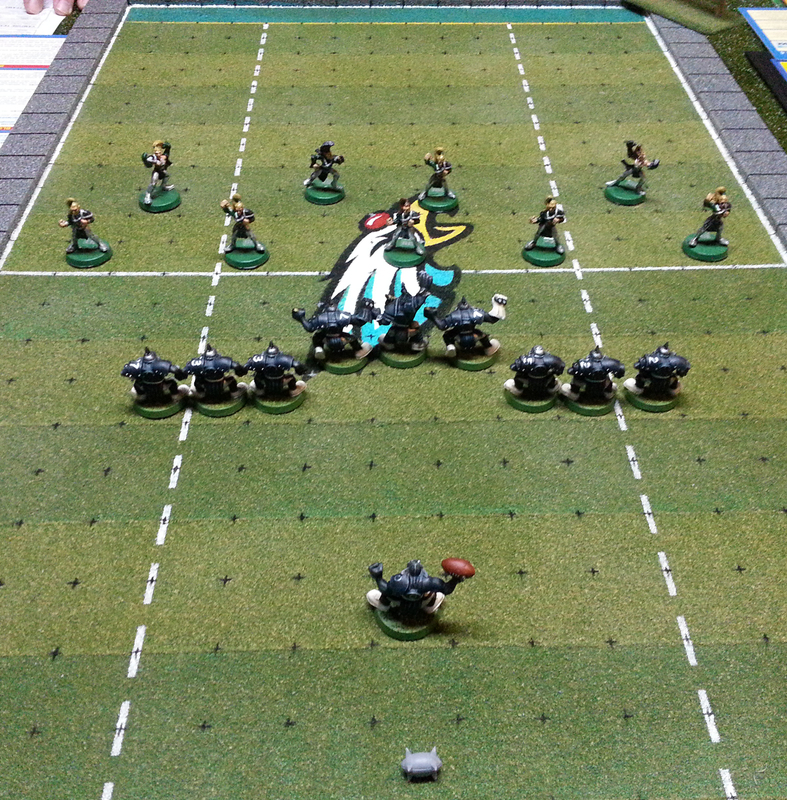 Both sides set up in the 'wedge' formation and prepared for what lay ahead. The Raiders took the ball to the right, trying to press the flank. 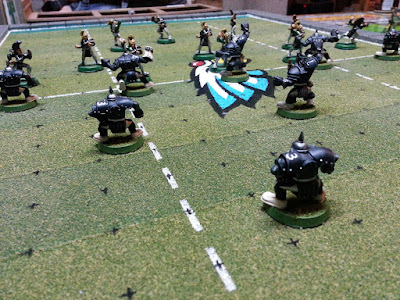 Unfortunately, the linemen, Black Orcs and blitzers couldn't keep the elusive Thorons on the ground, which curtailed the Raiders' efforts. Then it happened: A fumble! 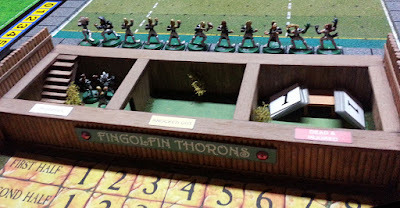 Unable to stop the fleet-footed Elves, the Orcs could only watch as the ball was picked up and thrown beautifully down field on a long pass. 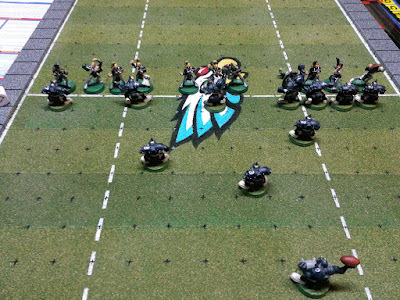 Knowing they couldn't catch the receiver making his way to the end zone, the Raiders instead focused on what they do best: Knocking their opponents in the dirt! Yeah, there's no catching that guy! With a couple of turns in the first half to go, the score was 1-0 for the home team. 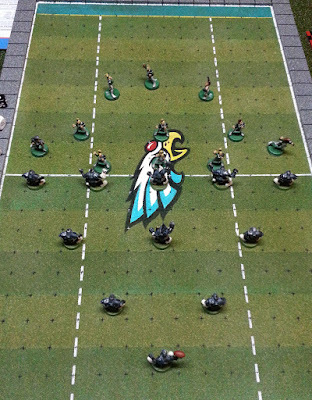 The squads set up for another kick off by the Thorons. This time, the Raiders set up in a more solid formation, while the Thorons crowded the line. 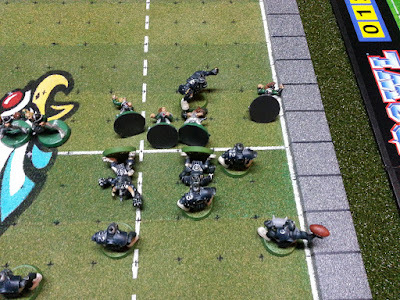 The ball bounced into the end zone, so the Raiders gave it to their "Thrower" (it truly is a relative term with the Orcs). 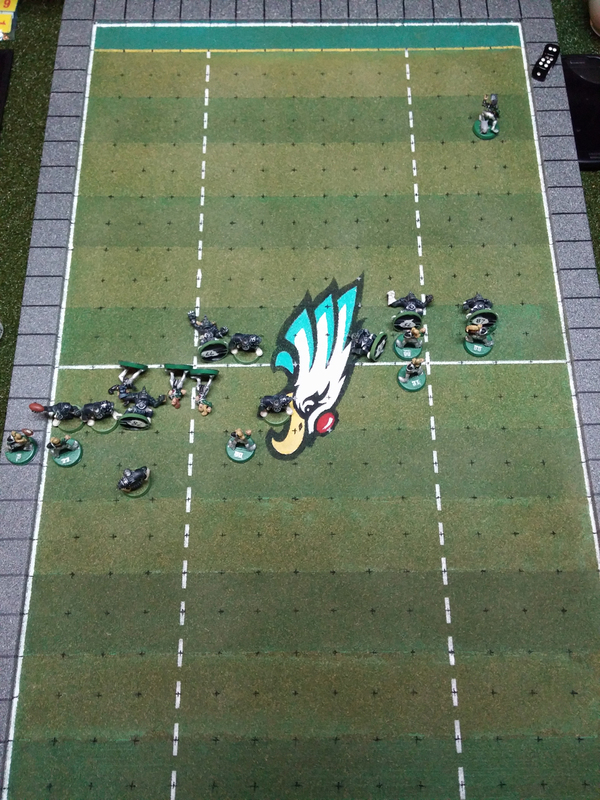 Knowing the speed of the Elves, especially around the ends, he backpedaled a few feet and let the crush of bodies on the scrimmage line take shape. As expected, the Elves closed like sharks to blood in the water. 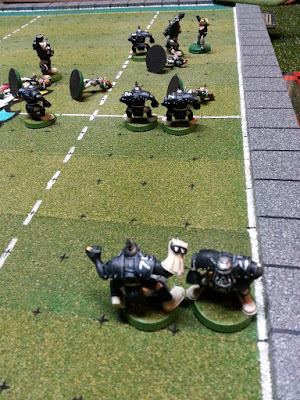 With barely any time left, the Raiders, realizing they weren't going to score this half and that the Elves would get the ball first in the second half, tried to bring the pain. This worked with limited success. 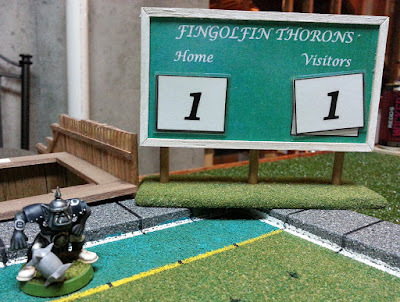 End of the first half: Thorons 1, Raiders 0. 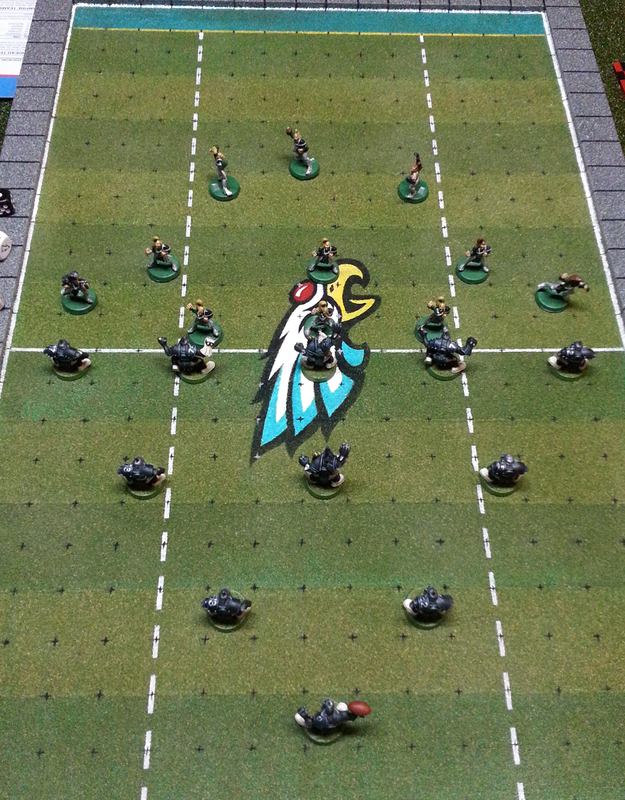 The second half saw the Thorons get the ball deep in their back field. 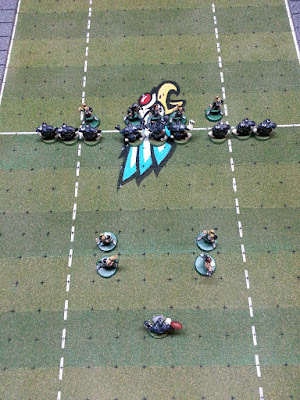 Their player calmly waited for his receiver to get open, but this proved more difficult than expected. The Raiders were blasting Thorons left and right, keeping the Elves from executing their play. Finally, one Thoron got free. The pass was up, the catch was good. 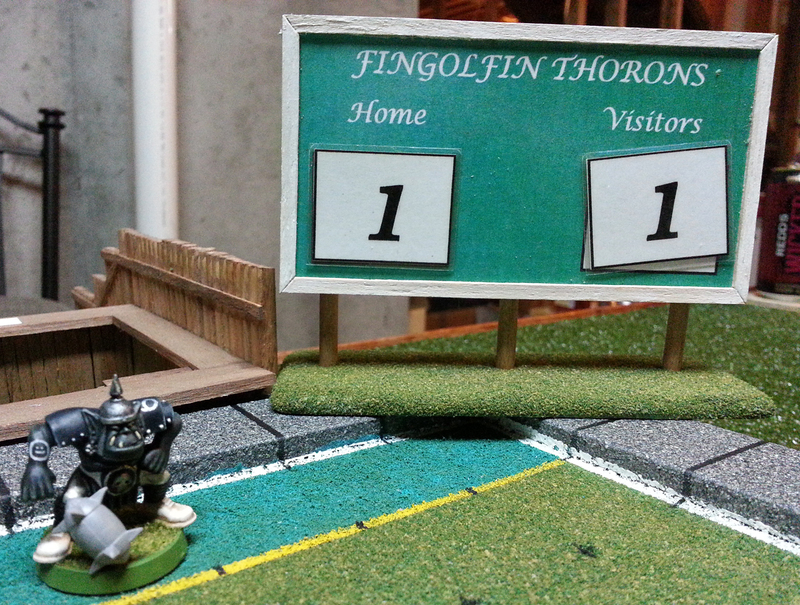 Then it happened...a hit by a blitzing Raider into the Thoron blocker blasted him into the runner. 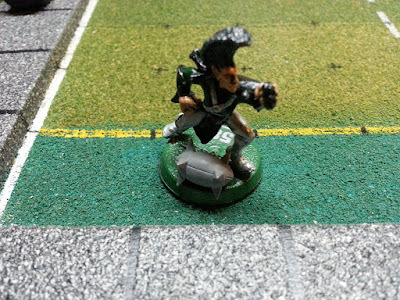 The ball and player were driven into the stands. The player was carted off to the locker room, bleeding from his pointy ears. The ball was thrown back into the pitch...into the vicinity of a Raiders lineman! He scooped up the ball and in an uncommon bout of wisdom and physical aptitude, threw the ball at a wide open player down field! 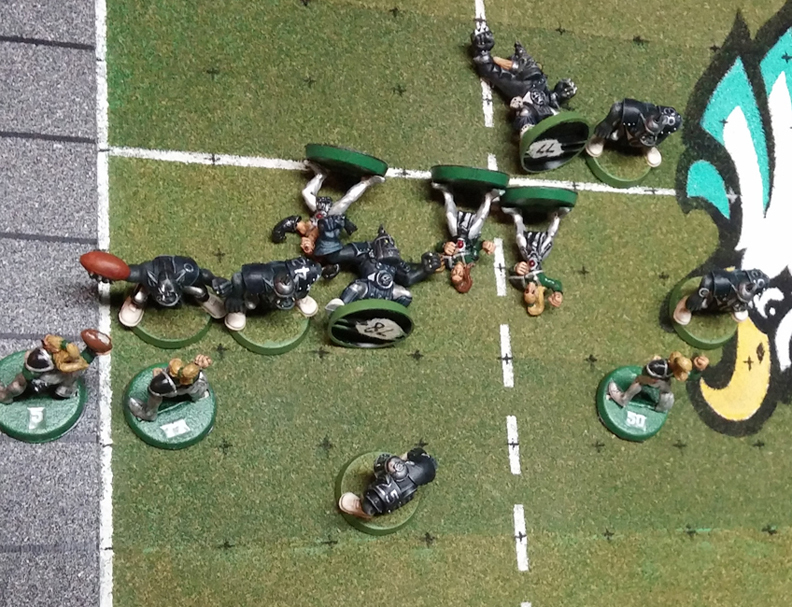 Even more shocking, the receiving Raider caught it and galumphed in for a touchdown! 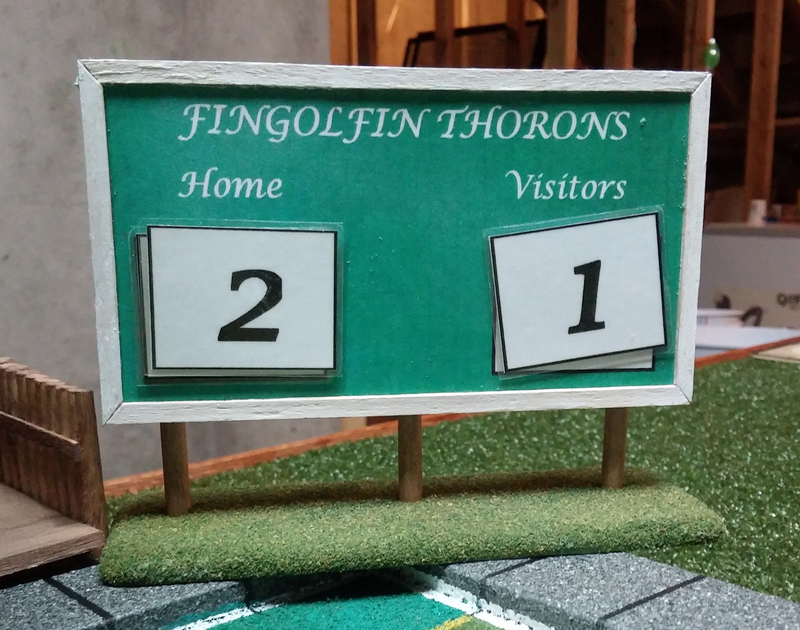 In the waning seconds of the second half, the score was tied! It was late and Terry had to go home, but we couldn't end the night in a tie! 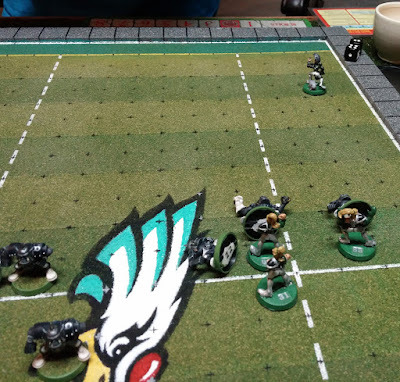 A die toss later and The home team came away with a Pyrrhic overtime "win". 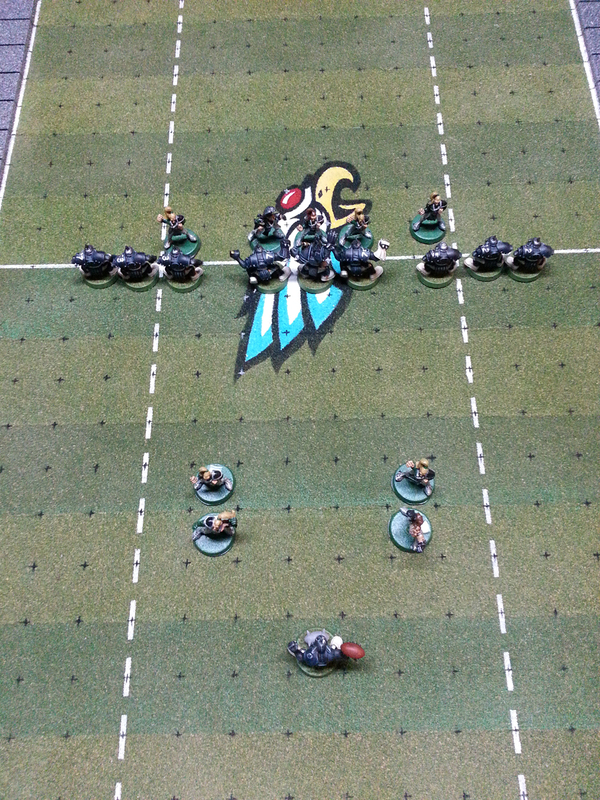 Great game and one that really taught me about the strengths and weaknesses of both teams.